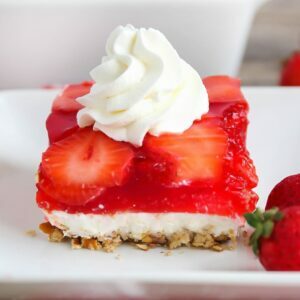 This classic treat is always a crowd pleaser with a pretzel crust, cream cheese layer and strawberry jello topping! Strawberry Jello Pretzel Salad is the ultimate combination of sweet and salty! Be sure you make it for your next get together, but don’t plan on having any leftovers! The recipe I’m sharing today is a CLASSIC. It’s especially popular during the summertime and holidays, but quite frankly, I think it sounds appetizing year round. 😉 Jello Pretzel Salad! It has a salty pretzel crust, yummy cream cheese center, and a fruity jello layer on top. 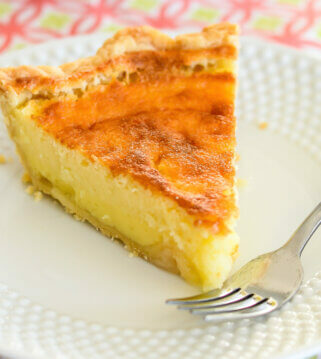 It comes from Kraft Recipes and is one that you may not have tried, but if you haven’t you may have been living under a rock for the last 20 years – lol! This recipe does require a little bit of planning and time (waiting for jello to refrigerate always seems like forever, right?! ), but let me be the first to tell you that it’s SO worth it. Mix chopped pretzels, 1/4 cup sugar and butter together. Press into the bottom of a 9×13 pan. Bake for 10 minutes and let cool. Beat cream cheese, 1/4 cup sugar and milk together with a blender. Fold in Cool Whip and spread over the crust. Refrigerate until ready to use. Bring 2 cups of water to a boil and place in a large bowl. Add gelatin mix and stir for 2 minutes until dissolved. Stir in 1 1/2 cups cold water. Refrigerate for 1 – 2 hours or until thickened. 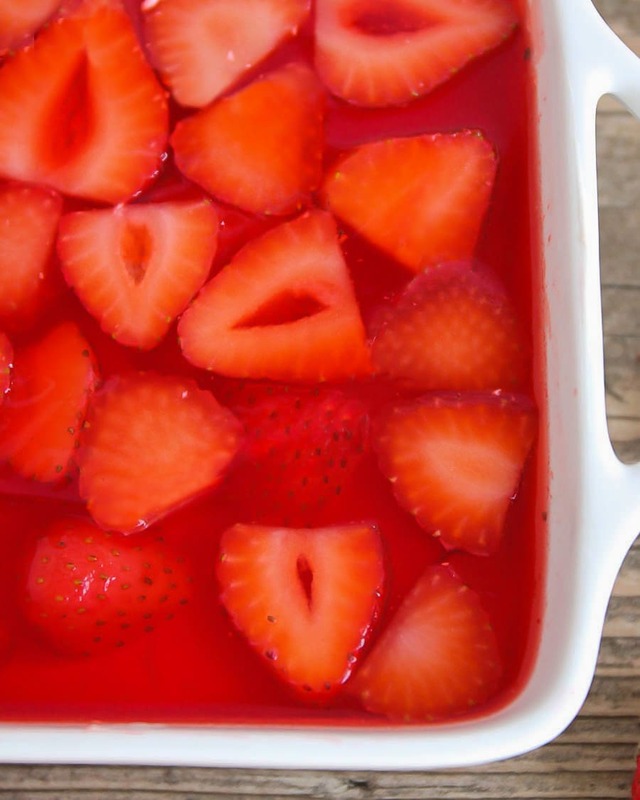 Stir strawberries in with your jello and spoon over your cream cheese layer. 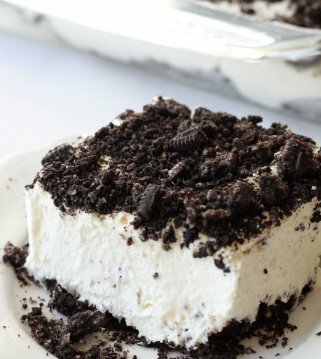 Refrigerate for another 3 hours. Keep refrigerated until serving. ENJOY! I’m drooling just thinking about this sweet/salty/creamy/fruity dessert!! I’m thinking it might be about time to whip up some Pretzel Salad! 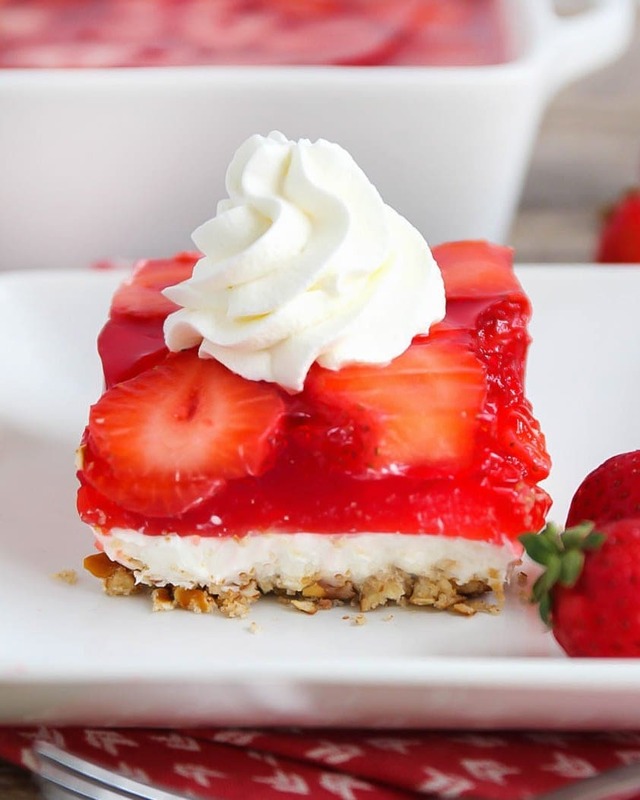 This classic treat is always a crowd pleaser with a pretzel crust, cream cheese layer and strawberry jello topping! 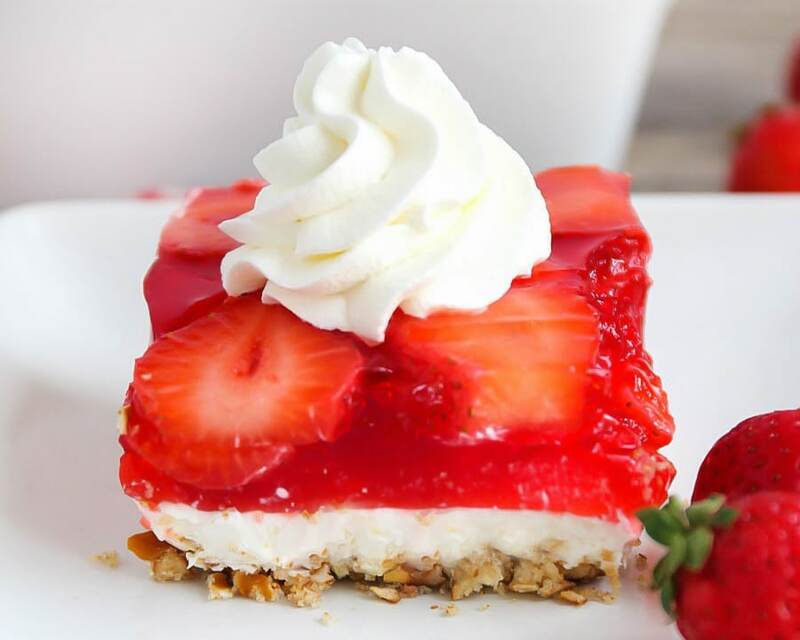 Strawberry Jello Pretzel Salad is the ultimate combination of sweet and salty! Mix chopped pretzels, ¼ cup sugar and butter together. Press into the bottom of a 9x13 pan. Bake for 10 minutes and let cool. Beat cream cheese, ¼ cup sugar and milk together with a blender. Fold in Cool Whip and spread over the crust. Refrigerate until ready to use. Place boiling water in a large bowl. Add gelatin mix and stir for 2 minutes until dissolved. Stir in cold water. Refrigerate for 1 - 2 hours or until thickened. 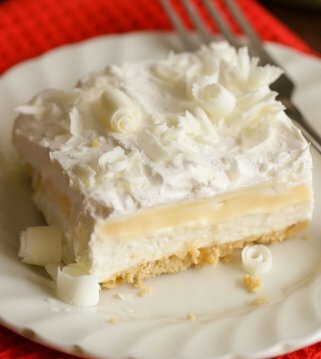 My boyfriend’s mom makes this and it’s one of my favorite desserts! We always ask her to bring it when we have a BBQ! I love jello pretzel salad! It is so yummy!! It is both sweet and salty. Hi, I want to make this. Can I substitute real whipped cream for Coolwhip? Thank you. It looks gorgeous! 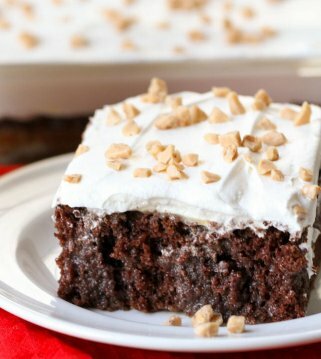 I have fond memories of this recipe from over 40 years ago when my aunt would bring it to family reunions. Thanks for sharing! I love recipes that bring up fond memories! Thanks so much! I have made this salad quite a few times now & every time I do, it’s gone in minutes. My in-laws request this every year! my favorite is the crust! Some people consider jello As a side dish. In our family jello was a dessert. You cant go wrong with this recipe no matter how you choose to eat it. 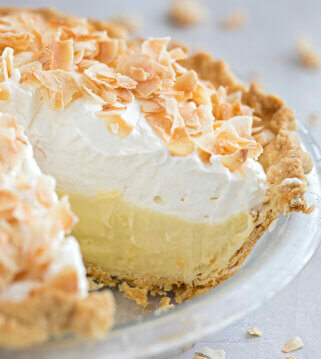 the combination of sweet and salty make it a great dessert!